This Featured Application was written and produced in 2010 for our client, Industrial Power Systems, Inc., (IPS) of Jacksonville Florida. The article is posted on their website and the PDF brochure, also created by Concept Communiqués, is used today as a presentation handout, a customer mailer, and a brochure at industry trade shows. After two years of construction and a cost of $336 million, the famous Argosy Casino on the Ohio River owned by Penn National Gaming, Inc., has been dramatically expanded, updated, and reborn as the new Hollywood Casino Lawrenceburg. 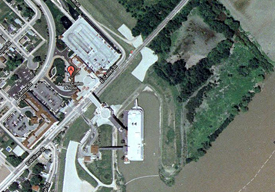 The newest, largest riverboat casino in the United States is located in the city of Lawrenceburg, Indiana, less than 30 minutes from Cincinnati. It boasts 4,400 gaming positions, 3,232 slot machines, 88 table games and a 41-table World Poker Tour® poker room. The property also includes a 300-room hotel, multiple dining options to meet every guest’s needs, and on-site parking for up to 4,000 vehicles. Marked by the scale, grandeur and modern design of the project, the new Hollywood Casino is more than twice the size of the property’s existing casino vessel. Hollywood’s two decks, each wider than an aircraft carrier and nearly as long as a football field, can accommodate nearly 9,000 guests, approximately a 5,000-person increase from the casino’s former capacity. The classic style and glamour of 1930s art deco Hollywood is carried throughout the casino and is complemented by the latest technology and amenities for ultimate guest comfort. 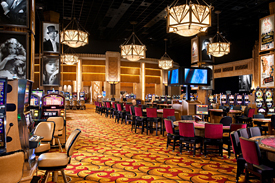 Among the casino’s major attractions is an exclusive VIP Producer’s Lounge, expanded high-limit gaming area and the largest card room of any kind in the Midwest. The casino brings classic Hollywood to life with a 60-foot serpentine video wall, nine large billboards and more than 300 flat screen displays featuring first-run movie trailers, video shorts, entertainment programming and sporting events. At the center of it all is Hollywood on the Roof, a performance area with a panoramic screen resembling the Hollywood Bowl where bands entertain and video content can be projected in grand scale. Hollywood on the Roof features a high-energy circular bar that looks out onto the casino atrium and its giant eye-catching chandelier. The electrical power requirements of this self-contained entertainment “village” of 9,000 guests plus employees are both intricate and very demanding. Highest quality electrical power systems by Industrial Power Systems, Inc. of Jacksonville, Florida, were rightly chosen for the job. The new Hollywood Casino is more than twice the size of the property’s existing casino vessel. Hollywood’s two decks, each wider than an aircraft carrier and nearly as long as a football field, can accommodate nearly 9,000 guests, approximately a 5,000-person increase from the casino’s former capacity. Designed by naval architects Lay Pitman & Associates, the Hollywood Casino Lawrenceburg is a self-propelled riverboat semi-permanently held in place at its dock in Lawrenceburg by a series of giant hydraulic cylinders which maintain a fixed position for the vessel relative to landside access, unaffected by rising and falling river levels. Because it is a riverboat and may have occasion to set sail whenever a need arises, the Hollywood Casino Lawrenceburg was built to the exacting rules and regulations of the American Bureau of Shipping (ABS), the agency that provides the certification necessary for the operation vessels in American waters. A key aspect of the project setting it apart from all other marine casino applications is the sheer size of the enterprise. Construction manager Messer Harmon L.L.C. sought to alleviate any possible difficulties related to electrical power equipment coordination by specifying that one company would have the responsibility to supply the bulk of the electrical equipment on board. This fell to the marine expertise and experience of Industrial Power Systems. Working to electrical system specifications by Lay Pitman, IPS designed the equipment to meet system needs and to meet ABS regulatory marine requirements and coordinated the installation and commissioning with Kuhlmann Design Group, the project electrical consultants. The ship service main and propulsion switchboard provides all electrical power and control for the vessel from three 1825 kW, 480 volt, 3 phase, 3 wire, 60 Hz engine generator sets while underway, and for the generators to be on automatic standby to shore power when the vessel is docked. In the latter arrangement the switchboard is designed to allow the generators and shore power to operate in short duration parallel operation when required to allow closed transition (hot) transfer of power without any interruption to casino operations and services. The complete package is built around the Ship Service Main and Propulsion Switchboard which provides the primary control and distribution for the ship’s three Caterpillar 1825 kW generator sets and shore power connections. Shore power is delivered from five 1500 kVA (1200 kW) utility-connected power isolation transformers provided within the scope of supply. 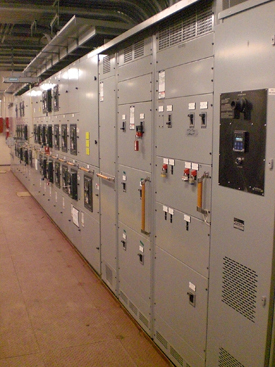 On the distribution side the scope of supply included all ship panelboards, all main distribution switchboards (MDBs), and MDB transformers ranging in size from 150-500 kVA required for ship and casino operations. The panelboards provide specific control for loads such as elevators, the annex, annex chillers, bars, machinery rooms and electrical rooms, uninterruptible power supplies, the four marine propulsion power units, and spares. An emergency power switchboard with ASCO automatic transfer switch and two Liebert 80 kVA Uninterruptible Power Systems complete the scope of supply. The ship service main and propulsion switchboard is constructed with one main ship service bus rated 4000 Amps and braced to 150,000 Amps fault current. A bus tie circuit breaker functions to split the port and starboard sides of the switchboard to allow operation during a casualty situation such as an onboard fire where the port or starboard sides of the ship can be isolated. Under normal operating conditions the bus tie circuit breaker is closed allowing full port-starboard interconnection and operation. Two Caterpillar 1825 kW prime power (2000 kW standby-rated) generators and two 1500 kVA shore power isolation transformers are connected to the port side, while the third 1825 kW generator and remaining three 1500 kVA shore power transformers are connected to the starboard side. Generators and transformers provide power at 480 volt, 3 phase, 3 wire, 60 Hz. The IPS switchboard power sections are separated from the control cabinets to provide additional arc flash protection for the crew. The High Resistance Grounding (HRG) is in the foreground. The starboard side distribution is next with breaker safety lockouts in use. Starboard and port main distribution and generator sections are in the center. Note the integral circuit breaker lifting trolley for ease of maintenance. The primary switchboard control for each generator set is a multi-function Genset Control Package (GCP). It provides basic engine control, synchronizing, and engine load control to provide short duration parallel operation with shore power which allows closed transition (hot) transfer of power with no interruption to casino and ship operations. 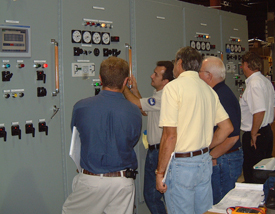 System control and automation is via a master programmable logic controller (PLC) which constantly monitors utility power quality, starts and stops generators, and provides circuit breaker control; and a touch screen operator interface panel (OIP) which allows operators to set system modes and program load demand and load shed sequences, and also provides system overviews and annunciation. The system is designed to operate in one of two primary modes. In the riverboat mode (isolated boat/no shore power) all ship’s service electrical power requirements are provided by the generator sets and delivered through the ship service main and propulsion switchboard, independent of shore power. Adjustable load demand algorithms are set in the OIP to select and sequence the generators needed to meet the vessel’s power requirements. In the shore power mode the generators are placed on automatic standby and the ship is powered from all shore power transformers that have available sources of land-based electric utility power. Failure of shore power in this mode of operation automatically starts and synchronizes pre-selected generators and connects them to the bus. The switchboard then monitors the shore power connections and automatically closed transition transfers the system back to shore power when it is restored. A load shed sequence protects the system in the event of system overload or generator set failure. Feeder circuit breakers to the chillers, panelboards and the Annex are equipped with shunt trips and integrated in a staged process into the load shed scheme. Loads are re-added manually when the fault condition has been resolved. The system also features a backup Emergency Run Mode for generators should Genset Control Package (GCP) controllers fail. In this mode the generator circuit breakers are operated manually and the generator sets manually paralleled if multiple units are required for the load. IPS Test Engineer and Field Service Technician, Vladimir Bagaturov (Certified EGSA Technician) demonstrates the touch screen control of the system to the customer's representatives and Naval Architect. Representatives from ABS; Messer Harmon L.L.C. ; Lay, Pitman & Associates; and Kuhlmann Design Group were invited to attend witness testing in Jacksonville. Shore power and generator set inspection and start up, parallel operation sequence testing with load banks, dock trial, sea trial, and owner’s operating engineers training were all part of a complete commissioning process.